In all examples, red car B gives way. (a) if that vehicle or pedestrian is stopped - you must remain stationary until it is safe to proceed. (b) in any other case - slow down and, if necessary, stop to avoid a collision. Give way to any pedestrian or bicycle rider (child or adult) on, or entering the crossing. if there is a dividing strip, remain stationary and give way if the pedestrian is on your side of the dividing strip. 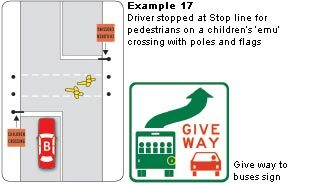 When in a built-up area, you must give way to any bus displaying the Give Way to Buses sign if the bus is indicating to move out from the kerb. On a multi-lane road, this only applies to the left lane. If the left lane is a bike lane or is obstructed (e.g. a parked car), drivers in the lane next to the left lane must also give way. The bus driver must exercise due care and only move out if it is safe. You must give way to all trains or trams on or approaching from any direction at level crossings. You must stop and give way to pedestrians between the edge of the road and a stationary tram. to a vehicle making a U-turn. If turning left or right at the intersection, you must also give way to any pedestrian crossing the road you are entering. If you are proceeding straight ahead and a pedestrian is intending to cross the road, you must drive with due care and attention and, if necessary, take action to avoid a collision. You must also give way to any vehicle or pedestrian at or near a Stop sign/line or Give Way sign/line at any other place. Importantly, if you are approaching a Give Way sign/line, and there is no danger of colliding with another vehicle or a pedestrian or bicycle rider crossing the road, you do not have to stop at the Give Way sign/line before proceeding but you must slow down and prepare to stop if this becomes necessary. You must give way to any pedestrian or bicycle rider on, or entering the slip lane and to any vehicle approaching from your right including an oncoming vehicle that has turned right at the intersection (Example 20). A slip lane is an area of road for vehicles turning left that is separated at some point by a painted island or traffic island. when there are road markings or signs indicating otherwise, the terminating road can be either of the roads that meet at the T-intersection. This is a modified T-intersection (Example 22). If you are on the terminating road, you must give way to all vehicles approaching from either direction on the continuing road and to any pedestrian at, near or crossing a continuing road. Examples 23 and 24, show a vehicle giving way when approaching the intersection where the terminating road is the 'stem' of the 'T' and there are no traffic lights, road markings or signs. 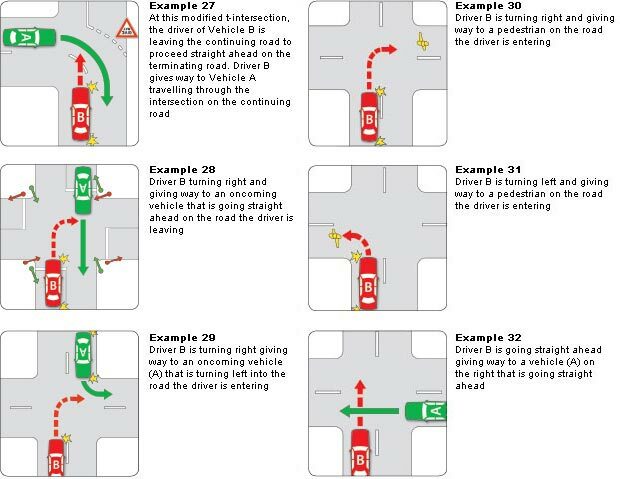 Examples 25 and 26, show that when turning right from the continuing road, you must also give way to any approaching traffic including any vehicle turning left into the terminating road. You must also give way to any pedestrian or bicycle rider crossing the road you are entering. At a Y-intersection, you should Give Way to the right unless there are signs and road markings indicating otherwise. Before starting to turn right, you must give way to vehicles approaching from the opposite direction to you, including vehicles turning left (Examples 28 and 29), but not if they are turning left from a slip lane (Example 20). If you are driving on a continuing road at a modified T-intersection and intend to turn into the terminating road, you are 'turning right' and you must give way (Example 27) to oncoming traffic on the continuing road. You must also give a right turn signal. If you are turning at an intersection, you must give way to any pedestrian who is crossing the road you are turning into (Examples 30 and 31). You must also Give Way to a pedestrian or bicycle rider who is entering or crossing a slip lane if you are turning left at the slip lane. When leaving a parking space at the edge of the road or moving off from the kerb, you must give way to any vehicles, including motorcycles and bicycles, travelling along the road. You must also give a change of direction signal for at least five seconds to warn other road users. 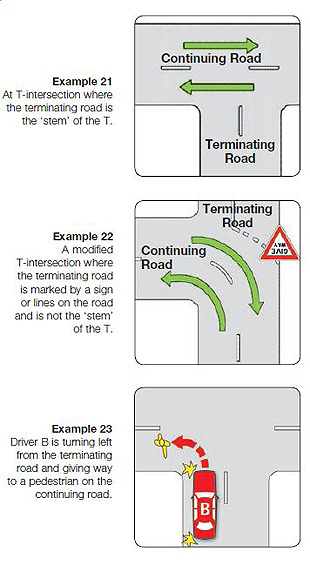 Example 27 shows a driver wishing to enter a terminating road from a continuing road at a modified T-intersection. Even if the road is straight ahead, you must signal and Give Way to all other road users on the continuing road. Vehicle A is on the continuing road at all times. Vehicle B is leaving the continuing road to enter the terminating road. Vehicle B must Give Way to vehicle A because it is turning across the path of an oncoming vehicle. You must give way to all vehicles and pedestrians when doing a U-turn and a 3-point turn. You must give way to any vehicles on the roadway of a divided road you are entering through a break in a median strip (Example 36). The median strip might be a narrow grassed strip or wide enough to require a short 'crossover' road (Example 37). You must also give way to any oncoming vehicle already in the break in the median strip that is waiting to turn. You must give way to any vehicle, including bicycles, approaching from the right at an intersection not controlled by signs or traffic signals and not a T-intersection. This is known as the 'Give Way to the Right' rule (Examples 32, 33, 34 and 35). 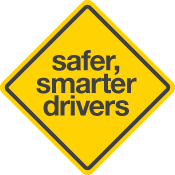 At intersections without traffic lights, road signs or road markings, that are not T-intersections, you must give way to any vehicle approaching from your right. This is known as the ‘Give Way to the Right’ rule. This is highlighted in examples 32, 33, 34 and 35. It doesn’t matter if one vehicle is turning and the other going straight ahead, at an intersection not controlled by signs or traffic signals, that is not a T-intersection, you must give way to the right. If you are on a road where the traffic is merging from two lines to one line, you must give way to a vehicle on your left or right if any part of that vehicle is ahead of your vehicle. This is called the Zip Merge (Example 38). 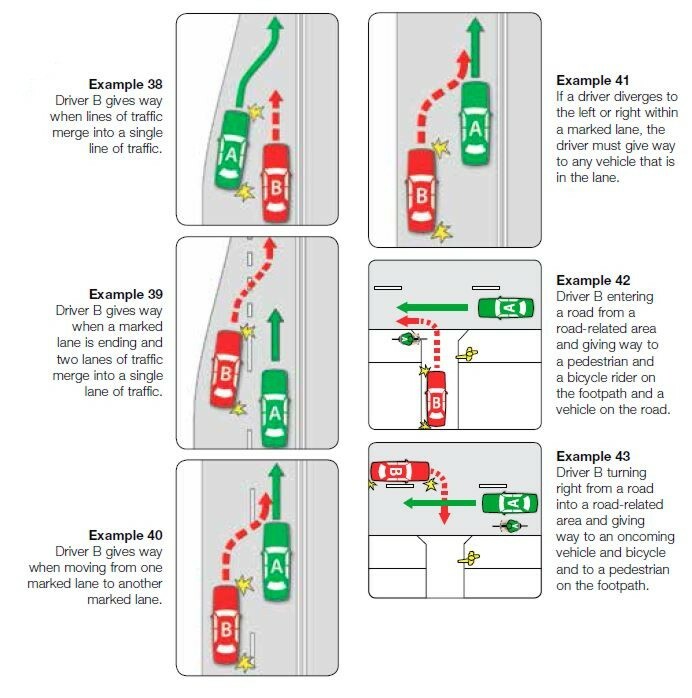 The Zip Merge does not apply where lane lines are marked between the vehicles and one lane is ending (Example 39) such as at the end of overtaking lanes and when entering the freeway. If you are driving on a multi-lane road and want to move into another lane of traffic, either to your right or left, you must first check that it is safe to change lanes, give a change of direction signal clearly for long enough to warn other road users, and give way to traffic in the other lane (Examples 39 and 40). 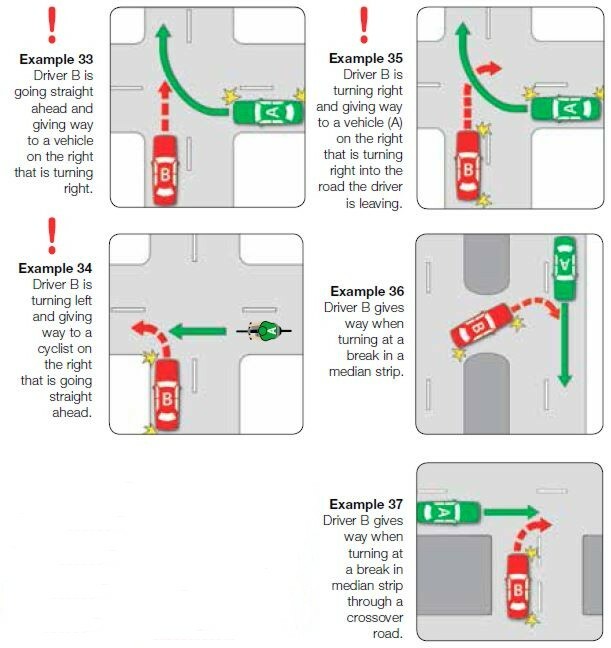 This also applies to bike lanes and where the road is wide enough for two lines of traffic but there are no lanes marked on the road (Example 41). When driving into or out of a road-related area (such as a driveway or car park - see Glossary) or adjacent land, you must give way to all vehicles, bicycles and pedestrians on the road, footpath or road-related area (Examples 42 and 43). You must give way to a police or emergency vehicle with a warning siren sounding or displaying red and/or blue flashing lights to ensure that it is provided with a clear and uninterrupted passage. You must Give Way to any vehicles already on the roundabout. Remember to look out for bicycle riders at roundabouts. How to drive through single-lane and multi-lane roundabouts is described in more detail in the following section.